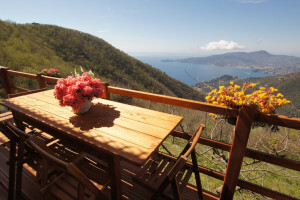 Visit Villa Oneto during your holidays in Liguria, Italy. The view from Villa Oneto over the coast and the sea is fascinating. 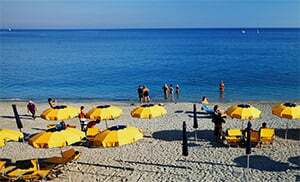 Within a few minutes by car you are already at the beach and the pleasantly refreshing water. The tranquillity and natural vegetation will contribute to your relaxation during vacation. Enjoy a hiking tour through the beautiful environs. You can also set out on cycling tours right from Villa Oneto. 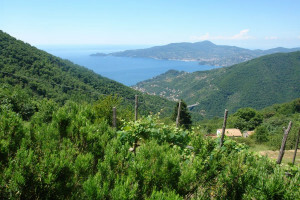 In addition, enjoy the many culinary delicacies and ligurian specialties. Villa Oneto is a locality in the San Colombano Certenoli municipality in the Genova province. Villa Oneto was already inhabited right from early times, and in the early Middle Ages it became part of the Genova province. The small idyllic village has 115 inhabitants, and lies 374 metres above sea level. Villa Oneto belongs to the San Colombano Certenoli municipality and is a locality in the Genova province which lies in the Liguria region. In the vicinity of Villa Oneto are several other villages like: Case Cade (2.2 km), Leivi (2.1 km) and Cicagna (13.1 km). From Genoa take the Chiavari highway exit from the E80 and follow the Strada Provinciale 32/SP32 in the direction of Via S. Gaetano.